Not to be confused with Sushant Singh Rajput. 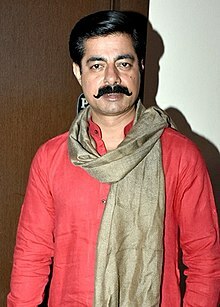 Sushant Singh (born 9 March 1965) is an Indian film, character actor, television actor and presenter known for his works predominantly in Hindi cinema. He made his film debut in 1998 with Ram Gopal Varma's Satya. He rose to stardom with the 2000 film Jungle, and received rave reviews for portraying slain bandit, Durga Narayan Chaudhary. He then went on to star in period dramas such as Ambedkar and The Legend of Bhagat Singh, and established himself in Bollywood. He has also starred in a few Telugu films. Recently, he is hosting the crime show Savdhaan India, aired by Life OK and STAR Utsav. He is the “Honorary Secretary” Of CINTAA (Cine and Television Artists association). ^ "I was a total bore in college: Sushant". The Times of India. ^ "The Hindu : "The Legend of Bhagat Singh". ^ "The Hindu : Full of spark". ^ Sushant Singh. "Biography - Sushant Singh". ^ shary. "Sushant Singh Profile -Picture -Bio -Body Measurements". Hot Starz. ^ "Sushant Singh: Was apprehensive to turn negative in 'Hate Story 2'". The Indian Express. 3 July 2014. ^ indialive, today. "Akshay Kumar 'Baby' Official Trailer Released". Retrieved 4 December 2014.